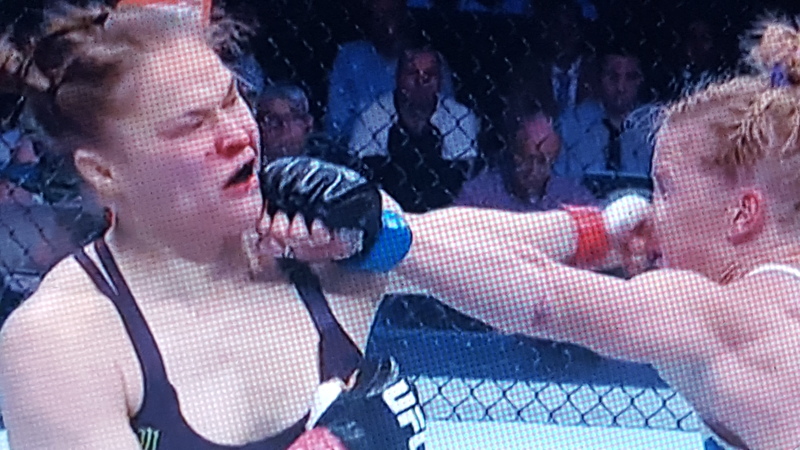 November 15, 2015, Queens, NY In one of the most monumental upsets in combat sports history, Holly Holm, the Preacher’s Daughter, did what was considered next to impossible by not only beating, by not only stopping, by not only KOing, but hospitalizing Rowdy Ronda Rousey after a BRUTAL kick to the face followed by a pair of hammer strikes. Holly Holm is a former women’s boxing champion, and she displayed her boxing skills by striking Rousey with punch after punch. Rousey was very aggressive but was clearly outmatched from the start. She appeared very fatigued after the first round which was attributable to being hit, being discouraged, and probably not being in the best shape. Rousey’s stardom probably took away from her training. She’s getting ready to begin filming a movie (a remake of “Roadhouse”) and she promoted this fight heavily. The results for UFC chairman, Dana White, were mixed at best. The fight was held in Melbourne, Australia, and drew over 56,000 spectators. This was the largest crowd ever to see a UFC event. The pay-per-view sales were probably substantial. But, the most marketed UFC star was completely outclassed, battered to the point of having to go to the hospital for a split lip that is requiring plastic surgery. The upside is that if White pairs the two bantam weights at UFC 200, which is on July 9, 2016, the live gate revenue and pay-per-view will be beyond profitable. However, the Rousey brand could be damaged irreparably if she loses in similar fashion. When a fighter of Rousey’s stature loses, s/he can never regain the aura of invincibility. Sonny Liston and George Foreman lost it when Muhammad Ali upset them. Mike Tyson lost it when James “Buster” Douglas upset him. Rousey now joins that dubious list. Some feel that Rousey got her comeuppance. She was more than a bit confident and claimed that she was the best fighter in the world. She wanted to fight Floyd Mayweather, and many people actually thought she could beat him. Insanity. And unfair to her. He’s bigger, stronger, faster, more experienced, and way more technically savvy. The deluded said, “When she grabs him…” Right. When she grabs him. Like Mayweather would just stand there. Rousey was extraordinarily well marketed, probably excessively. She’s starring in movies, recently published a memoir (and toured fairly extensively), makes several television appearances, and promotes the UFC like no other UFC fighter. Rousey was even put on the cover of Ring Magazine which is called “The Bible of Boxing.” This angered more than a few boxing purists and was seen as the highly respected publication lowering its standards as well as insulting its audience. Hats off to Holly Holm who remains undefeated at 10-0. She is a tremendous fighter, and for the moment, she’s on top of the world, even though she’s down under.